DoughXpress docking dough is an important step to both prevent oil absorption and to prevent crust from separating and bubbling. Now docking dough has been made easy. 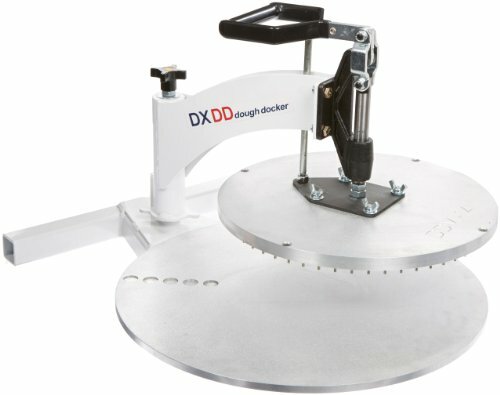 From DoughXpress, the manufacturers of the pizzaXpress line of pizza dough presses, comes the DXDD dough docker. Now docking pizza dough is as quick and easy as pressing dough. Dual plated upper platen includes durable dual plated aluminum platens, steel docking pins inserted and trapped between platen layers to ensure pins can not come out, weight of platen and steel docking pins provide better dough penetration vs. molded plastic versions. Docker requires no skilled labor. Docks crust in one motion, to ensure consistency and eliminate arm fatigue. Interchangeable docking platens. Swing out upper platen for easy dough placement. Powder coated white finish with aluminum upper and lower platens. Stoppers on lower platen make for perfectly centered dough placement. View More In Commercial Dough Presses. If you have any questions about this product by DoughXpress, contact us by completing and submitting the form below. If you are looking for a specif part number, please include it with your message.